The Courtship Maze at Gretna Green Famous Blacksmiths Shop is a maze with a difference and great fun for all ages. An impressive structure, located near to the car park, the Courtship Maze is shaped like a pair of interlocking wedding bands (symbolic of its romantic location); covering a space of 70m x 40m and built from stone. Before you enter the Courtship Maze you will notice two entrances: this is to symbolise the beginning of our life's journey, which we make independently before we meet our partner. Choosing which entrance is the first of many decisions, twists and turns that will either lead to dead ends or to the goal! In the spirit of the Courtship Maze we suggest that couples choose separate entrances and along the way, through various features within the maze, you will get the chance to catch a glimpse of each other; maybe a fleeting chance to touch, even kiss but no opportunity to get together until you reach the goal: the bridge at the centre of the Courtship Maze. For families it is a journey of discovery and competition - can brother beat sister or daughter beat, dad? The Courtship Maze sets the challenge: "Where getting together has never been harder" but ultimately it is about everyone having fun as they wind their way through! Early visitors have enjoyed discovering the secrets of the Courtship Maze. Local mum and daughter Laura and Courtney Copland were not sure what to expect from their first visit: "While the Courtship Maze was being built we were very curious to know what it would look like inside. I love the romantic features that you come across as you follow the route of the maze and the inspirational messages. For adults, it is a lovely place to explore and for children, I think they will love the chance to simply run around and enjoy trying to hide from parents. You also get an amazing view once you reach the centre, where the two separate pathways meet and climb the steps on to the bridge." 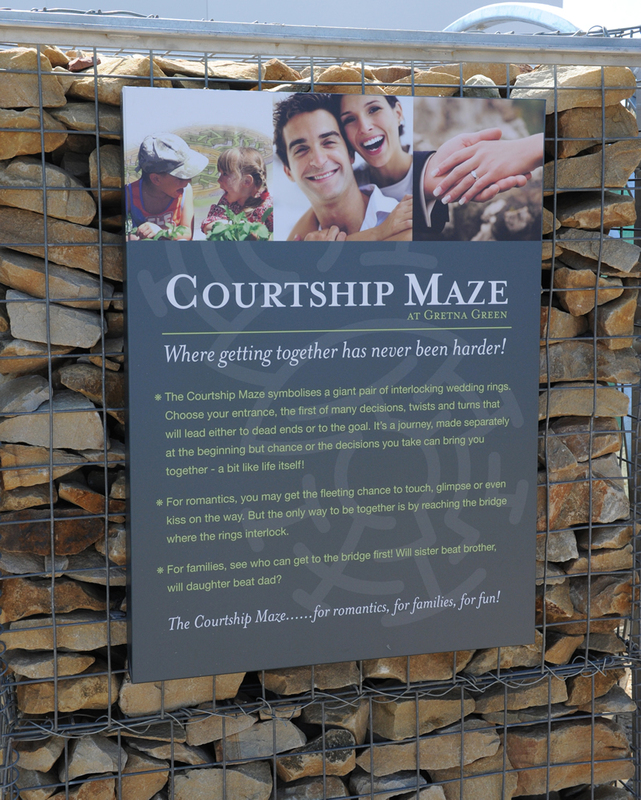 The Courtship Maze is open every day from 10 am and entry is FREE for everyone. Grab a LoveLock from any of our shops before you head in, to commemorate your visit, either by locking in on the bridge, within the maze or outside on our LOVE wall.